Now coming to the recent experience, last week I had throat infection. Usually I take antibiotic but this time I felt I should not take any medicine. I prayed to Baba and said that I am going to take Your Udi water for 3 days and I want to post this experience in MP-group. Baba answered my prayers and that's the reason I am posting here. 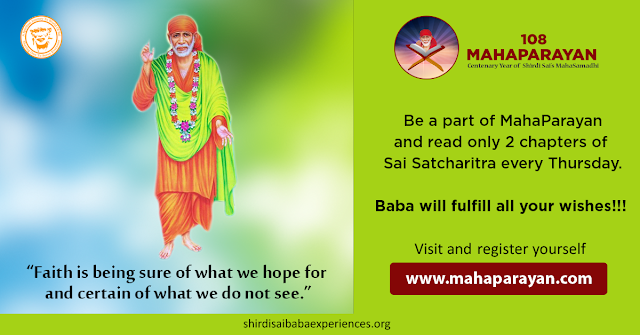 I request all Sai devotees to have full confidence on our beloved Sai. At right time He will show us the right path. Om Sai Baba, You know what my wishes are for my kids. Please bless and guide them throughout their life time. Bless my parents and brother’s family, my husband, kids and myself too. Om Sai Ram. What to speak of Baba’s grace for His devotees? None can be like You Deva - The Greatest Saviour ever. Love You Deva. Jai Jai Ho Sai.